I admire outlets, but not the highway shopping center outlets. I admire round brass floor outlets. When I first began noticing them, they were in lecture halls near podiums and then on occasion I would spot one in an architectural magazine – a detail in some gorgeously appointed room with vaulted ceilings and leather furniture. I had begun coveting those shiny floor outlets just like most women had eyes for handbags or high heels. When I realized that a floor outlet in the middle of my cabin floor would make it possible for me to position a lamp and have a plug for my computer, I requested such from the electrician. I pictured an outlet cover of dull brown plastic to match the floor color. I didn’t even consider a brass jewel box outlet. The electricians arrived early one morning and began adding a number of new plugs. The two guys, A.J. and Matt from S & S Electric, would pass by each other as they worked under the house, up in the attic or back and forth to their truck. When I noticed that Matt had stopped in the living room and set a pile of tools near the blue masking tape marks on the floor, I stopped to watch a moment. He reached for a plain square cardboard box, opened the lid and withdrew - a brass colored outlet. Oh, my! When I expressed surprise, he held it for me to see, as if he were a jeweler showing me a ring. He said that he loved putting them in. They were just so beautiful. I stayed to watch as he drilled a hole. 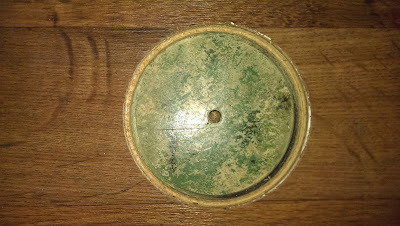 The first layer revealed the green linoleum which had apparently for years graced these cabin floors. As an amateur houser, I loved uncovering house history. Linoleum was first developed to cover battleship decks but quickly became popular for use in land-bound structures. I was a little sorry that the cabin's linoleum flooring had been covered, but I wasn't willing to pull-up the newer floor to find out if all of the linoleum looked as good as the sample circle. I have been promising myself that this cabin would be where I write and read, not work. In my other home of twenty years, I had ripped up carpets and linoleum glued to plywood. Underneath were the original wooden floors - unfortunately, painted with lead green paint! Cautiously removing that paint took most of a summer. Therefore, you see, I am leery of starting on another rip-apart project. After the electricians were done and packed and gone, I moved furniture to the cabin, bringing along an antique lamp with a yellow cord that I thought would be a nice counterpoint to the brass outlet. I turned the tiny locking screw on the outlet cover, opened its lid and plugged in the lamp. And, then, as I had been promising myself, I curled up to read.